When the chance came my way to review a new hybrid from Adams I have to admit I was giddy with excitement. Adams has become the unofficial king of hybrids it seems and I couldn’t wait to finally get a chance to put one of these offerings through the proper paces to see what the hype was all about. All these professionals who are playing Adams hybrids had me seriously wondering what was so great about them. The Super 9031 is a new hybrid to compliment an already wide range and very popular line of offerings for 2013. Adams set out to improve on the hybrid that was already one of the most popular ones on Tour, the original Idea Pro Black 9031. The plan was to add more distance, yet maintain the look and control that better players love. VST™ cut-thru sole slot combined with crown slot produces exceptional ball speeds and higher launch compared to non-slotted hybrids and traditional long irons. I mentioned how excited I was to get an opportunity to test one of the offerings from such a popular line. After unboxing the club, I instantly became a little nervous to be completely honest. The reason for this is that in the past I have struggled with hybrids that have more of a driving iron appearance and have had much greater success with a more “mini fairway wood” looking hybrid. The Super 9031 definitely fits the bill of what I’d consider more of a driving iron look, but I wasn’t about to let that plant any preconceived notions before I hit this myself. Right away I loved the appearance of the club. I really like the color and subtle graphic scheme Adams went with for their 2013 woods and hybrids. While the shape of the 9031’s head didn’t immediately pull me in, I was very pleased with the face of the club. Specifically, how big it was for such a small hybrid. It certainly passed the looks test and I couldn’t wait to get out and start hitting balls to see just what this hybrid was all about. 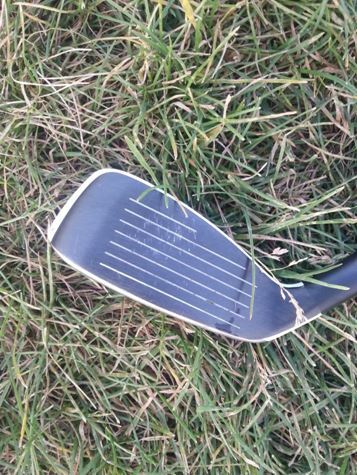 As I’m standing over the first shot I was about to hit with this club I remember thinking to myself, “smooth swing, don’t shank it” – hardly great swing thoughts to have, but remember I don’t have a great history with hybrids with this shape and I was a little concerned. That concern went away immediately after impact from the first shot I hit. Suddenly I was half way shocked and excited to see more. I went through an entire bucket on the range that first time out and I was standing there in a state of shock. I expected low shots that I lacked control with, but I was consistently hitting the highest gentle draw I’ve ever seen out of a hybrid. On the course the success continued and what I found was a hybrid that is easy and very fun to hit. The sound is a nice, slightly higher-pitched one that immediately indicates a solidly stuck shot. Balls struck solidly give back a great feel that gives you the sense of feeling the ball hanging out on the clubface for just a split second before it takes off to that high, repeatable trajectory that I couldn’t wait to see over and over again. The model I tested has 20 degrees of loft, so I expected to get something between 205 and 215 yards on well struck balls. I wound up getting consistently 210 to upwards of 225 yards out of this hybrid, depending on the wind direction. The trajectory was such that I knew that if I had a helping breeze I could launch the ball high and have no problems getting a ball that covered plenty of distance, while maintaining a steep landing that kept my roll out very manageable for those long shots into the greens. Adams has a history of being a company that decides to pair their woods and hybrids up with some very solid shaft offerings and they did just that with the 9031. 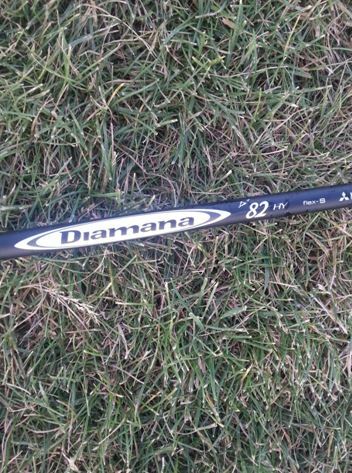 The stock shaft that I tested with this hybrid was the Mitsubishi Diamana D+82, and it more than held its own. This shaft held up regardless of how hard I needed to go after the ball and the feeling of the power transfer through the ball is definitely something that I came to like. I felt that I could count on a consistent feel and performance from the combination of the 9031 head with this shaft. That’s not always something that can be said these days unfortunately. I was admittedly intimidated by the smaller profile of the 9031 when I first opened the box. Previous struggles with smaller headed hybrids left me assuming I’d find this club difficult to hit. I could not have been more inaccurate with those assumptions. The 9031 is not difficult to hit at all. 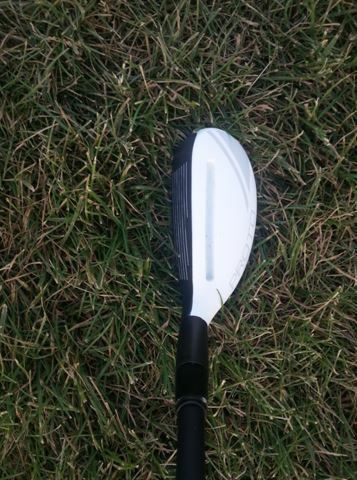 The profile of the head may be on the smaller side, but the club face is quite large and I continually found it easy to hit and extremely accurate. What more could you ask for in a hybrid? Available in wide ranges of lofts (16, 18, 20 and 23 degree), there are options for most every golfer out there. If you’re in the market for a solid hybrid and are similar to me in that you aren’t sure you can hit a hybrid with a smaller head like this, do yourself a favor and demo this before you decide it’s not for you. You’ll be glad you did! The Adams Super 9031 runs $199 and should be on everyone’s hybrid pondering list. Great review, Jake. From the first pictures I saw of this hybrid, I instantly liked it. Sets up like a long iron, and has an overall compact look to it. I like it. That 16* hybrid seems quite intriguing. Not the most attractive offering Adams has put out from the address position, but I do like the looks of that face. I’d love to try it out as a 4 iron replacement. Nice work Jake! Great review. I am not sure I like the look off it, but might change my mind if I was standing over it. Great review Jake. Really liked the personal feel and the expectations compared to results. Adams definitely makes some good hybrids. My wife put my 4 and 5 of the a12os set in the bag and yesterday she was hitting them farther and better than her Nickents. I am only using the 6H of tht set now because I love how high they get the ball. I want to hear down the road whether you kept this in the bag for the long term. I keep going back to Adams for my hybrids. Great review. From address it looks strange to my eye but that face sure look forgiving. Good to hear that Adams is keeping up its history of great hybrids! Great job on the review. I apreciate the integration of your personal concerns into the review versus a more sterile “just the facts” approach. Adams appears to have produced another great hybrid. I will have to demo the 9031 soon and see how it works for me. I love little hybrids. And if it’s super easy to hit, what else could you ask for. Seems like Adams has a solid offering on their hands. Great review. I saw this club first hand and really liked it. I too was not sure if I would be able to play it, but now that I have read this review, I would love to give it a shot. Not easy on the eyes, but I will hit a few balls on the range if I can find a demo. I am currently using Adams latest driver and 3-metal, and just love ’em. Mine sounds like a wooden club and goes nowhere. Also it’s highly inconsistent. Any chance it’s a fake? The golf outlet I purchased from swears all equipment is legit and has good feedback. Owners post on here regularly.